Energy Management: Six poor ways of finding waste and "Why?" Six questions request data, the seventh seeks understanding (often a good place to start). 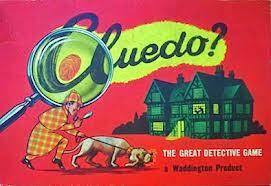 - solving it for you "Professor Plumb, in the Billiard Room, with the Candlestick". But TV detective aficionados believe criminal law requires Means, motive, and opportunity so Cluedo misses the central aspect of any plot - the motive - "Why?" Energy waste is a motiveless crime - (if only it were otherwise - think of the fees:) and it is a given - it happens all over the place and all the time. Fortunately an Energy manager is a custodian for only some places and some times and attempts to prevent energy waste happening "on my watch"
So energy waste is generally a passive act, generally an unintended oversight or byproduct of some , and that is why "Why?" is a great question. It leads to all the others, but in a complete process of elimination way. If you know why energy is being consumed it isn't waste - obviously (at some level) ! "the boiler, because its cold, in the office"
So if science is seeking the explanation, energy management is about identifying the apparently inexplicable and solving for "Why ?" This is how it works - it is very helpful to start with what you can justify with clarity, subtract from consumption and thereby literally deduce waste. The "who?" doesn't matter so much - we are all guilty, the "where?" is everywhere and the "when?" is pretty continual. However once the waste is fully apprehended the "what?" and the "how?" lend comprehension to lock up the waste and keep it in custody - For surely the energy manager is a custodian before anything else.